Five acres had been designated a public cemetery under ‘The Cemeteries Act 1882’, on section 12 on the Kaipaki Road. From 15 June 1901 the Pukerimu Cemetery (originally known as the Pukekura Cemetery) was administered by a voluntary Board of Trustees – John Fisher, James Anderson, Joseph Gane, William Scott and William Sturges. The first burial, recorded 28 October 1903, was Alice Vickers who had died two days earlier, after being thrown from her horse. 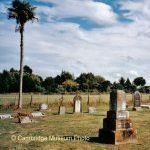 The cemetery is in the country 6 kms from Cambridge and many of the headstones record the prominent families in the Pukerimu/Kaipaki districts. In June 1981 the Pukerimu/Kaipaki residents met and decided to hand over the running of the cemetery to the Waipa County Council (now incorporated into the Waipa District Council). The following index is from a Cemetery Map given to the Cambridge Museum at that time.